Legend has it that this dish was originally made in Rome for Pope Pius XII, and thus named for his little “papalina” (skullcap). Nothing against Pius, but this little papalina is for Francis. Why? Well, these days he seems to be the only leader on the planet that is making any sense. That’s because he’s the only guy talking about “Peace, Love, and Understanding.” He’s like the last hippie, wearing a papalina instead of a bandana (and doing it without weed or LSD). Peace Brother e Buon Appetito! Check out our wine pairings to compliment this dish. In a large skillet over medium heat, sauté the butter and onion until translucent. Add the prosciutto and cook until golden, but not crisp. Remove from heat. In a separate bowl, beat the eggs and the cream until smooth, and then mix in the Parmigiano. Bring a large pot of salted water to a boil. Cook the fettuccine until al dente. Drain it, retaining some of the cooking water. Return the prosciutto and onion mixture to low heat. Add the pasta to the skillet. When thoroughly combined, add in the egg mixture and mix thoroughly. Add salt and pepper to taste. Add a bit of the retained cooking water only if necessary to achieve a creamy result. Serve immediately with a sprinkle of Parmigiano and black pepper. Meraviglioso! Semplice. My kind of recipe. 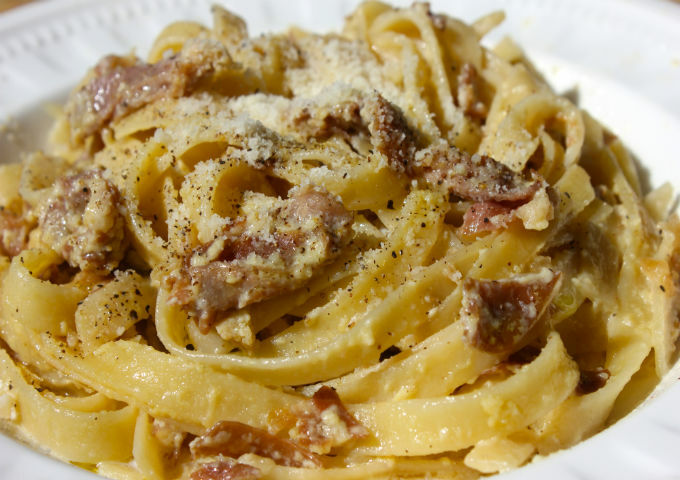 Looks like a terrific alternative to a classic Carbonara. Grazie, Frank! And for your fine note on the hippie Love-Peace-Understanding state of Francis’ papalina. Of course you mean “presumably” without weed or LSD. This recipe reminds me of my mother’s version of Spaghetti with Eggs that she used to make on Fridays when we weren’t eating meat for religious compliance. Thank you for posting this recipe. Will look forward to making it for family and friends!